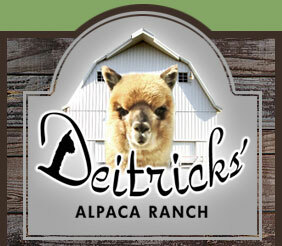 We invite and encourage you to visit our ranch to experience the "alpaca lifestyle" first hand! A ranch visit will provide you with an opportunity to see alpacas up close, to learn about their habits, feel their amazing fleece, learn how fleece is processed and browse our ranch store for alpaca products and hand knit goods! Our ranch is open to scheduled group visits as well as private tours by appointment. Please use the "Contact Us" page, or call 309-373-5281. We look forward to seeing you and introducing you to this amazing lifestyle! The alpacas have asked me to offer Birthday Parties! Basic details are: 2 hours, up to 10 kids, up close and personal alpaca time, pics with pacas, cupcakes and a wet felting alpaca fiber project for $150. Each party will be designed for your child with their age and love of alpacas in mind! Please call for information, 309-373-5281. We will be offering "Summer Tour Tuesdays" at the Ranch throughout the summer on the following days, and during the following hours: Tuesdays, June 5th and June 26th Tuesdays, July 10th and July 24th Tuesdays, August 7th and 21st Tour times are 10 am - 11am. The Ranch visit will last one hour and comprise of visiting our herd of 70 alpacas, feeding the alpacas, a tour of the ranch, and a brief lesson on the alpaca lifestyle. The cost is $5 per person.